Classroom libraries are a well-known and proven concept to engage students in reading. The immediacy of having books in the actual classroom versus going to the library enables more authentic book talks. One creative way to encourage students to read is to create a scavenger hunt within the books. To set this up, take stickers of your choice and place them on random pages in throughout the books in your classroom library. Be sure to RECORD where you’ve placed the stickers, and be sure to “hide” ample stickers throughout your books in order have enough for all of your students to find throughout the year. 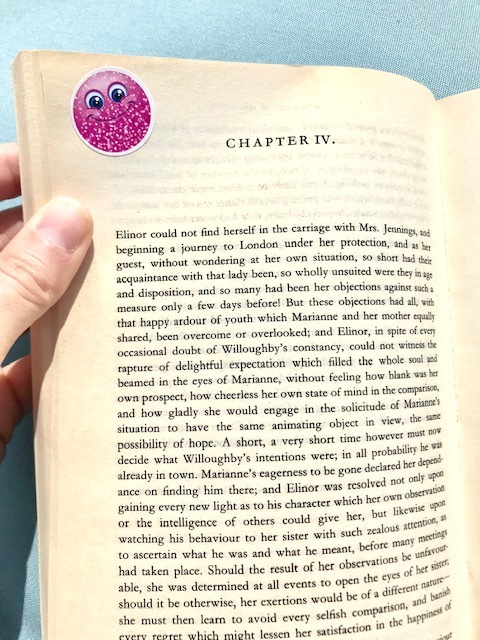 I would advise placing no more than 1-2 stickers in any given book. Then, create a rewards program and decide what students will receive when they find one of the hidden stickers. I like to give students homework passes or bonus points on tests. You could also give candy— what student doesn’t like a “dum-dum” lollipop? When a student finds one of the stickers, the student brings the book to the teacher, and you will give the prize and then remove the sticker from the book. It’s important to remove the sticker because if you don’t, the student could simply tell everyone where to find the sticker and get the prize. I find that this strategy makes the reading experience more fun and that students really are encouraged to read more books. A. Have students turn their book club groups into teams. Each team can create a team name, logo, and slogan. Then, issue challenges for groups to compete against each other for prizes. Find an example of book club challenges here for Fahrenheit 451. B. Break the mold of literature circles and give students autonomy over their groups. Let them organize their reading assignments, discussions, and products. This can be scary for teachers because groups may really struggle, but that is part of the learning experience. Allowing groups to flail and fail can be the best teacher as long as students are asked to audit their process throughout the book club. C. Allow groups to select their own books to study during book club. Pedagogical studies have shown that when students have the freedom to make choices in the classroom, they are more motivated to take charge of their learning and more engaged in the learning process. However, student choice does not have to mean absolute freedom. You as the teacher can give students a list of books to choose from in order to target a specific genre or theme that fits into your overarching curriculum. Check out this FREE BOOK CLUB GUIDE to get started with book club in your classroom! FREEBIE! Subscribe today to unlock the FREEBIE LIBRARY from Bespoke ELA! Check out more about student choice in THIS BLOG post about 15 Ways to Integrate Student Choice into the Secondary ELA Classroom. Bulletin boards in the classroom provide a medium for showcasing the books students are reading! It’s a great way to use positive peer pressure to garner student interest in READING. Students can print out the pictures of book covers from the books they read and post them on the bulletin board with their names. The teacher can even give awards for reading a certain number of books. Think back to elementary school here for a concept that works even at the secondary level. Students can also create hashtags about books they’re reading and write them on the bulletin board graffiti style for students to guess the titles of the books. Using classroom decor builds a visual reading culture within the classroom and can motivate students to pick up and try new books. Check out THIS POST from my friend over at Reading & Writing Haven for more ideas on Classy Decor for the Secondary Level… including bulletin boards! How do you get your students hooked on reading? Share your ideas in the comments below! Meredith is the founder and creator of TeachWriting.org and Bespoke ELA. She has taught high school English for 10+ years in Dallas, Chicago, and New York City and holds a M.A. in Literature from Northwestern University. She has always had a connection to the written word-- through songwriting, screenplay writing, and essay writing-- and she enjoys the process of teaching students how to express their ideas. An avid tea drinker and anglophile, Meredith enjoys life with her husband, daughter, and sweet dog Lucy.